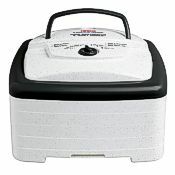 Food dehydrators are a great addition to any kitchen. They allow you to enjoy fresh foods beyond their natural shelf life and still maintain the nutritious qualities found in fruits, vegetables, meats, and more. 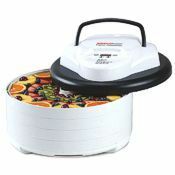 With a new food dehydrator, you'll be able to make fruit leather snacks and dried fruit in bulk from your garden-fresh berries, peaches and apples, as well as keep your extra tomatoes, carrots and herbs good through the winter. You can also make savory jerky that is healthier than store-bought choices. Dehydrating food is healthy for you and your family and it features many cost savings benefits over pre-dried grocery store options. 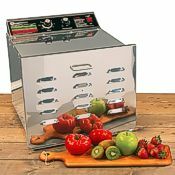 But before you purchase a dehydrator, it’s important to know what’s on the market and which model will be best for you. Below, we’ve provided a buying guide covering the most important things you need to know about investing in a food dehydrator. If you have any questions along the way (whether you’re still in the research stage or ready to add a model to your cart), please feel free to call us at the number above. Our friendly and knowledgeable staff is here to help you! The main decision you will first make when buying a food dehydrator is whether you want vertical or horizontal airflow, so let us break down the benefits (and some limitations) of each type. 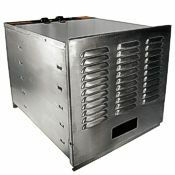 Vertical airflow dehydrators feature stackable trays with the heating component and fan at the bottom or in the top lid of the machine. Cheaply-made models of this type can result in uneven drying because they’ll dry the trays closest to the heat and fan faster than trays that are further away. This can require a lot of inconvenient tray rotation, and even then the results may not be good. High quality brands like L’Equip and Nesco/American Harvest, actually use a “hybrid” design in which warm, fresh air is ducted separately to each tray. The airflow then turns sideways, exiting laterally across the tray in all directions. This also helps reduce the potential for flavor sharing if you dry mixed food types on different trays. 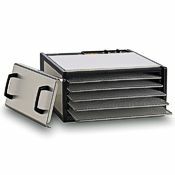 Many vertical-airflow models give you the versatility to add additional trays, beyond what come standard. 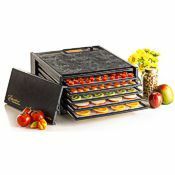 Many of these stackable dehydrators come with four to ten trays, but with add-ons you can multiply that number from two, all the way up to five times the original number! Some of our dehydrators actually increase their airflow automatically to accommodate the added trays. Our detailed model descriptions provide information on the many special features of each machine. 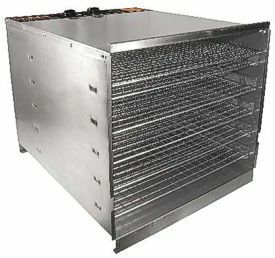 Horizontal airflow dehydrators have heating elements and fans in the back of the machine, with slide-in shelf trays that the food goes on. During the drying process, the air is directed horizontally across each tray evenly. Because the shelves slide into a separate cabinet in this design, you can remove some (or even all) of the trays to create more vertical depth for drying taller items. Access to your food during while dehydrating is a little easier with horizontal-flow machines, as each tray pulls out individually. Below, we’ve outlined features (and their benefits) found on many popular models. Any good food dehydrator will have an adjustable thermostat. Being able to adjust temperature allows more control in the finished quality of your food and prevents needing to throw away your time, money, and food from a bad, over-dried batch. The drying temperature can be set at the higher end of these ranges at first for very wet foods then turned down later to finish, as evaporative cooling keeps the actual food temperature lower than the dehydrator's air temperature. Another consideration for many users is the preservation of beneficial enzymes in fresh foods. Estimates vary, but there’s some consensus that these enzymes begin to degrade at about 104-106° F, and that they’re destroyed entirely at about 116-120° F.
Some users prefer digital thermostats for their precision, but a quality analog-type thermostat works well too, and a kitchen thermometer makes it easy to verify and make adjustments if desired. Dehydrators with slide-in shelves have rectangular trays that can provide the greatest ease and efficiency for linear food items like long strips of jerky. 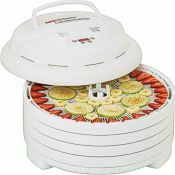 Stackable food dehydrators typically have round trays, though some are square, and they will usually feature a duct in the center of the tray for uniform airflow. 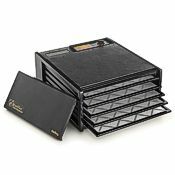 These stackable trays let you choose how many to run at one time, and some makers provide trays of differing heights (such as some one inch and some an inch and a half deep) for a variety of foods, and bottomless spacer rings are made available by some manufacturers, either as a standard feature or as an option. Most models are made from one or more type of plastic, and all high quality food dehydrators use FDA-approved materials. One popular structural material is polycarbonate, an exceptionally tough polymer used in products like football helmets and motorcycle fenders. In some circumstances if polycarbonate is used in direct food contact, leaching of a chemical called BPA can be a concern. But when not used in contact with food, it’s an excellent high-strength choice for structural parts. Stainless steel is another popular choice for trays and cabinets. In addition to the variety of materials used for trays, accessory mesh and nonstick sheets can be used on the trays, to suit a range of food types. 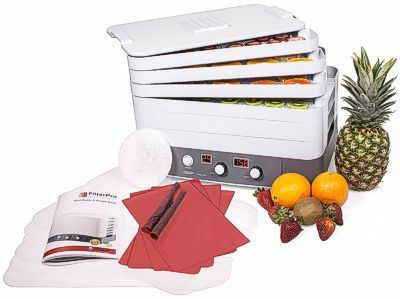 Fruit leather trays are available for making delicious fruit roll-ups. And here's a fun tip: By using fruits of different colors, like apricot and blueberries, fruit leather can be decorated with names, faces, and all kinds of fun designs! 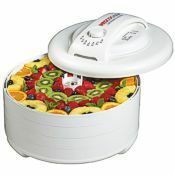 Food dehydrators have both a fan and a heating element, and total power usage ranges between about 300 and 1000 watts for most popular home-use dehydrators. The wattage used by the machine includes both the heating elements and the fan motors, and a good design allocates power between the two evenly for optimal performance and the best output. Fan size (and the number of fans) also varies between models. A strong dehydrator will naturally make some noise, as it’s moving a lot of air. Generally speaking, the horizontal-flow designs tend to be a little louder, and you can expect one to sound about like your kitchen’s range exhaust on a medium-high setting. In addition to the above standard features to consider, some models have special features that add to their value and versatility. Timers – Dehydrating takes some time, and the process probably won’t be at the top of your mind after a few hours. Models with timers allow you to set them and go—ensuring that even if you’re not home (or awake) when your food is finished, the machine will automatically shut off and prevent over-dried fruit, vegetables or meat. 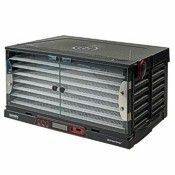 Filters – If you’re drying in an area with a contaminant like pet hair floating around, you may want to consider a model that filters incoming air. 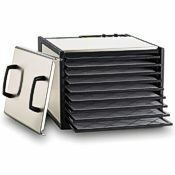 Machines like L'Equip's Filter Pro dehydrator feature an air inlet filter that removes airborne particles to keep them out of your food. 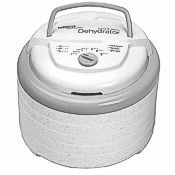 There are many different food dehydrators on the market. We recommend and cary only quality brands including Nesco/American Harvest, Excalibur, L’Equip, and Weston. You can learn more about each brand and their featured products below. 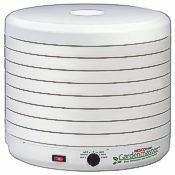 Whether you’re an avid gardener or hunter, Nesco/American Harvest offers a variety of dehydrators and accessories to fit your needs. 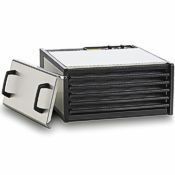 Three of their most popular models, the FD-1018A, the FD-1040, and the FD-75, have the ability to adjust temperature and vary the number of trays used (the FD-1040 can accommodate up to 20 trays!) These dehydrators automatically adjust their air flow to the number of trays in use, ensuring that your food dehydrates to perfection every time. For those looking to dry new and flavorful food, all American Harvest dehydrators include a 52 page recipe and instruction book—including pet-treat recipes and tasty spices and varieties for jerky. 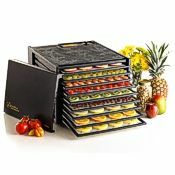 Excalibur dehydrators use a patented Parallexx airflow system to remove moisture from food, giving you outstanding results when preserving everything from strawberries and mangoes to potatoes and venison, beef or buffalo meat. The handsome appearance of Excalibur products makes them an attractive addition to any kitchen. All models are built in the USA and have exceptionally solid case and tray construction. 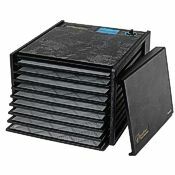 As mentioned above, the L’Equip Pro Filter Dehydrator is one of the best on the market for keeping airborne particles out of your food. 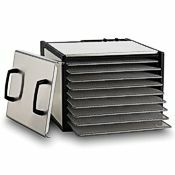 The Filter Pro pulls all air through a high efficiency filter element in its base before warming and circulating it through every tray. 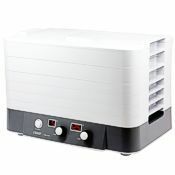 The L’Equip dehydrator's computer control analyzes dehydrator's temperature constantly to ensure a stable food drying environment, and the temperature is adjustable between 95° and 156° F. The Filter Pro includes a 24 hour auto-shutoff timer. 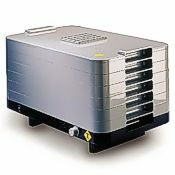 Weston’s stainless steel food dehydrator features chrome plated steel racks, a large 1,000 watt heating element, strong 7-inch fan, and 10 hour timer. Running this machine is simple and cleaning up afterward is even easier. 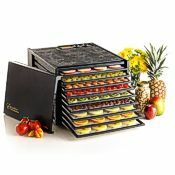 The P1000 food dehydrator features uniform food drying and little or no tray rotation, along with versatility in how many trays you use (from zero to ten). This model makes yogurt with its optional yogurt cups. 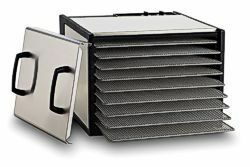 In addition to accessories for your food dehydrator, there are other items that can make the project even more efficient. When preparing your food for dehydration, we recommend a mandolin to slice your food thinly and uniformly. The thinner your food is cut, the faster and more efficiently it will dry. And cutting your food uniformly is a major key to having it all finish drying at the same time. Thinner-sliced food does take more tray space, but it’s well worth it, both in efficiency and quality of results. Using a quality slicer makes the process go quickly and easily. Warranty length is an important factor to consider, as they can vary greatly. But what matters even more is the actual quality of the machine, and the two aren’t always as correlated as you might think. 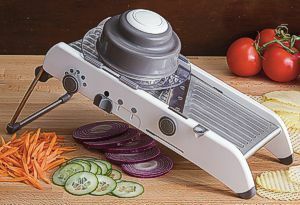 Some disreputable companies offer a long warranty, even lifetime, on very cheaply-made dehydrators, counting on many people to not bother making warranty claims when they fail—or they may not actually plan to stand behind the warranty when claims are made. The best strategy is to buy from a reputable retailer. At Pleasant Hill Grain, we carry only quality food dehydrators from companies we know to stand behind their products. Pleasant Hill Grain provides a superior online shopping experience for home and kitchen products, including our excellent selection of food dehydrators. We’re a factory authorized dealer for every dehydrator we offer, and we also carry a wide selection of accessories, appliances, and cook’s tools. Most items are stocked in our own facility for fast and reliable shipping to you.